Paharpur Class 1000 is our most heavy-duty crossflow industrial cooling tower. It is part of Paharpur’s renowned fleet of industrial cooling towers; this RCC field-erected, induced-draft crossflow cooling solution represents the best of industrial process cooling. The Class 1000 is an extremely versatile product which can be customised according to your particular requirements. It is especially well suited for heavy industrial applications in power plants, fertiliser plants, petrochemical complexes and petroleum refineries where water quality are not easy to control and reliable thermal performance is crucial. When it comes to process cooling, there is no ‘one size fits all’ concept that works. Paharpur’s products are customised depending on a multitude of factors – geography, environment, type of industry, requirement, water quality, temperature fluctuations etc. Our highly qualified engineers guide you through the process of selecting and designing a cooling tower best suited to your needs. The Class 1000 is a highly customisable Timber/FRP tower available in varying cell sizes that differ in 1.22m of length with customised fill type & density, fan type & size, number of blades, applied horsepower, fan cylinder height & shape, drift eliminator type & density, along with water distribution type and pump head. 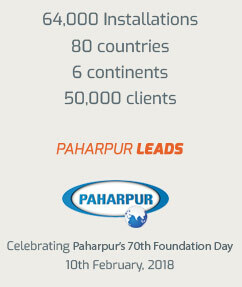 By providing a unique situation best suited to your need Paharpur guarantees that all components work flawlessly and deliver high performance so that you get the most out of your process cooling solution. One of the major advantages of crossflow cooling towers is that of online maintenance. Downtime is very expensive and Paharpur provides much scope for online maintenance – complete inspection of your cooling tower can be conducted during performance, in addition to replacement of fill, louvres and some support structures. A central plenum walkway above the basin provides easy access and a complete view of the fill area on both sides – such that damage, sagging and misalignment can be identified and promptly rectified. Crossflow cooling towers are provided with Paharpur Splash fill. These are perforated V-bars made of pultruded FRP and exhibit a remarkable immunity to poor water quality. Very often it is not possible to maintain water quality – there is always some particulate matter or dissolved chemicals which may cause clogging and damage to fill. Paharpur’s robust and resilient splash fill bars provide the necessary surface-area for effective thermal exchange while also providing minimum resistance to airflow. The result is a long-lasting fill which lasts for a long time. To ensure that you get the most out of our products and for your peace of mind, we can perform regular inspections of your tower- this gives you the distinct advantage of predicting operational problems and secure high tower performance with zero downtime. Paharpur’s experienced construction teams take complete control over the on-site erection of your tower with supervising engineers. Our team uses the latest technology to control shell geometry with a computerised laser surveying station; the concreting and material handling is managed by a centrally erected tower. Construction services also include finishing and testing your tower to help ensure that you get nothing but a high performing tower with a long service life. Paharpur provides many types of after-sales service agreements. For your peace of mind, we can perform regular check-ups of your tower to ensure that it delivers reliable thermal performance and also check for signs of impending damage. A service agreement with Paharpur will help you save money, downtime and maintain the economics of your operation without compromising on quality or deadlines. More than 70% of India’s power plants have a Paharpur cooling tower. The world leader has an answer to your most critical cooling requirements, even in the most rigorous conditions. Crucial hurdles are overcome by innovating existing technology. 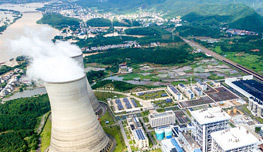 Couple the power of high cooling efficiency and operating cost to obtain reliable power generation. In high temperature conditions, we provide Fill-less counterflow towers with identical heat rejection capacities as their counterparts. Drive down operating costs with Paharpur’s industry leading cooling solutions. Our towers are made of High Temperature Resistant Engineering (HTRE) plastic- this makes them especially robust while dealing with very hot water operations for prolonged periods. Paharpur's builds customised towers to ensure high performance in the high temperature conditions of your plant. Rely on the industry leader to provide you with the ideal solution for you. The structures and hardware that we supply to the sugar industry in particular are Stainless Steel- to protect against corrosion. Flame-retardant PVC fills and fibreglass, to keep safety high and risk of damage low. Chemical plants require hard-wearing equipment that does not fail under extreme pH conditions. 100% Paharpur Only original spare parts can deliver precise thermal performance consistently. 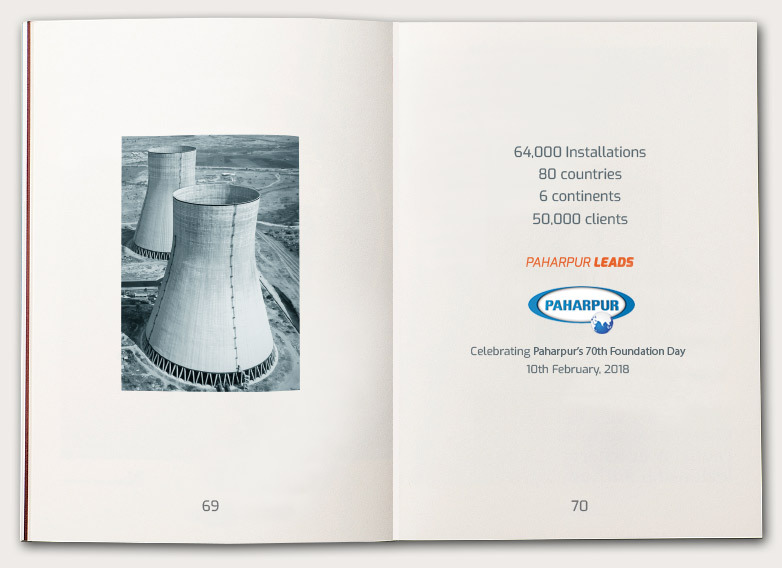 © 2019 Paharpur Cooling Towers Ltd.